The quarterback may fill the most important role on the football field, but he is nothing without his wide receivers. That said, there is perhaps no receiving corps in the nation feeling more pressure than that of the Oregon Ducks, in the wake of Heisman Trophy winner Marcus Mariota’s departure to the NFL. Every fan is familiar with this quarterback storyline. However, the Ducks have not been known for elite receivers in the recent past. This blue-collar position group is known more for its toughness and run-blocking prowess than its downfield threat level. This is not to say that the program has not produced great players. Over the past 10 or 12 seasons, Oregon has had standouts such as Josh Huff, Jeff Maehl, Demetrius Williams and Samie Parker. However, pure 1,000-yard receivers have been rare. 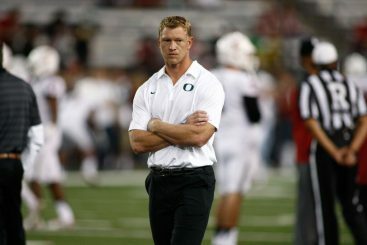 In fact, Maehl even came to Oregon as a safety prospect. Other programs such as Baylor, TCU, Clemson and USC have become factories for play-makers at the receiver position over the past few years. These teams stand at the top of the list in the minds of many in terms of wide receiver talent. While the Ducks may not thrive on the outside the same way that these other powerhouses do, the case could easily be made that Oregon’s 2015 receiving corps is not only the best in school history, but also the best in the country. Over the past 15 seasons, only four times has Oregon returned a wide receiver with 700 or more yards in one season during their career (Williams, Parker, Jaison Williams, and Keenan Howry). 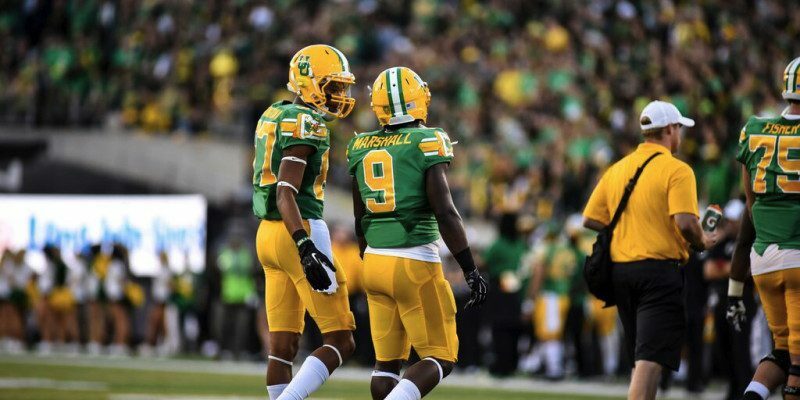 This year alone, the Ducks return three players who meet this criterion: Byron Marshall (1,003 yards), Darren Carrington (704 yards) and Bralon Addison. Addison, who is returning after missing last season with a torn ACL, recorded 890 yards in 2013. Had Devon Allen (684 yards) not been injured at the beginning of the Rose Bowl against Florida State, he would have likely joined his three teammates and allowed the Ducks to match their total of the past 15 years in one season alone. Heading into 2015, Oregon’s lone significant loss at receiver is Keanon Lowe, the only departure to record more than 50 yards in 2014. On top of that, the team returns arguably its most skilled and versatile outside threat in Addison. Before factoring Addison’s return, the Ducks return 89 percent of their receiving yardage from a year ago. Including Addison’s yardage from 2013, that number becomes 108 percent. It should be noted that Carrington, whose suspension is ongoing, and tight end Pharaoh Brown, who is making a remarkable but careful recovery from a devastating leg injury suffered in 2014, may not be available to start the season. However, even if these two were not included, the numbers still certainly display the production of this year’s group in comparison to those in school history. 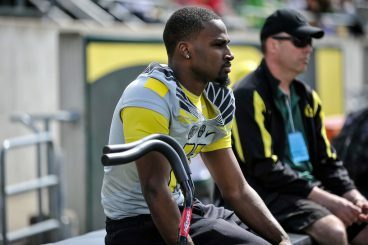 Before last year, Oregon had lost at least one 500-yard-plus receiver since Chip Kelly took over as head coach in 2009 (with the exception of 2013, when there were none). The 2015 season marks the first season in recent memory that the Ducks return all of their primary targets. But how do the Ducks’ receivers stack up against others in the nation heading into 2015? Among all programs in Power Five conferences, Oregon is the only team to return five players (Marshall, Dwayne Stanford, Brown, Carrington, and Allen) who have recorded at least 400 receiving yards and four touchdowns in 2014. Again, this does not include Addison, who easily surpassed those marks in 2013. To put this into perspective, Texas A&M is the only team to return four players that meet these benchmarks, and only Baylor, Cal, North Carolina and TCU even have three. Oregon has six including Addison. Clearly, Oregon’s depth and production at receiver is unmatched. 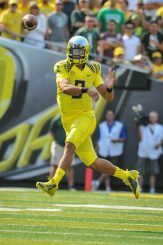 Still, some may argue that the production is due in large part to Mariota’s immense talent. While this is a fair point, it doesn’t tell the whole story. Mariota certainly helped these players maximize their potential to this point, but clearly they have also demonstrated their individual abilities. Allen, Carrington, Stanford, Addison, Marshall and Brown all earned four stars as recruits before arriving in Eugene, and they have all lived up to their ratings. Among Power Five programs, only Baylor, TCU and Oregon have three players in the Top 100 in yards per catch. Carrington, Allen and Stanford all averaged at least 14.8 yards per catch in 2014. In addition, Oregon was third in the country last season in passing plays of 20 yards or more. Again, Mariota certainly contributed to this, but these big-play numbers demonstrate the ability of the returning receivers to get open and contribute after the catch. These receivers also provide balance. Whoever wins the starting quarterback job will have some versatile targets. Allen’s speed, coupled with the Carrington’s and Stanford’s size, provide great deep threats. Marshall and Addison have the ability to consistently get open in the short passing game. Oregon’s quarterback situation is up in the air, but with a receiving corps this good, the team can make it work. Last season, Alabama offensive coordinator Lane Kiffin got plenty of attention (and rightfully so) for helping to turn long-time backup quarterback Blake Sims into something special. This was in part due to his ability to get outstanding wide receiver Amari Cooper open in space to allow Sims to get him the ball more easily. Oregon offensive coordinator Scott Frost did the same thing with running back-receiver hybrid Marshall, sending him on lethal quick routes that wore defenses down on early downs. You don’t need to be a Mariota to thrive with this group of special receivers, and Frost has a track record of demonstrating the innovation necessary to get the ball to his play-makers. With depth, talent and production all in place, Oregon’s 2015 receiving corps has everything it needs to prove it is the best in school history — and in the nation.